When you need to rearrange a text list you might be faced with borrowing operations. A first example illustrating the Block operations. Here we have just a piece of rough list representing rows of an html file coming, in some way, from an Internet site. This is a simple case, because the Blocks don’t need to stay at the beginning or at the end of the rows, but they can be traced anywhere, and embracing not all but only some of the text rows. More quickly: we should have drawn our block just on the wanted text and trim all outside, with only one action. A second example illustrating the Mass operations. Here we have just a rough list representing rows coming in some way from an Internet site that talks about philosophers (only a small piece of a long list is shown), and we want to extract only the philosophers’ names. 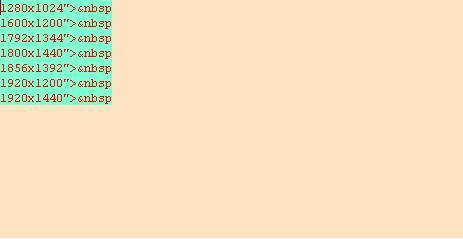 Open your text file and it will be shown in Block Mode (bisque background). In Block Mode the program disables the typical text-editing operations and handles the page as a large table with one column for each character. Trim outside: that erases all what exists out of your Block and realigns it to the left top of the page. Move and shift right: that does as the corresponding Copy operation but erasing the original Block. Clicking on (or the corresponding menu item) the program passes to the alternative mode. When in List Mode (white background) you can act quite as in a usual Notepad environment. Instead of the ways for selecting, copying, moving, undoing/redoing earlier illustrated for Block Mode, you have here to use: simple and double click, Ctrl + the standard accelerators C, X, V, Z and Y. Trim by Rules: that opens a dialog box for selecting each time a rule for clearing, splitting, cancelling, and keeping rows. 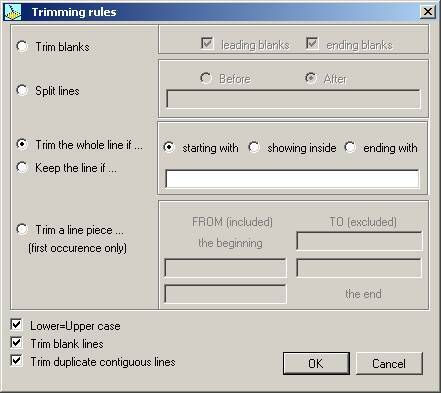 - Trim away a From-To piece of line that may be at the row beginning, middle or end. - trim away duplicate lines if appearing in sequence. Both, Sort and Trim by rules, can be undone/redone from the Block Mode status even if invoked from the List Mode and vice versa. Download from here the zip file ZTEXTTR.zip (version 1.0, less than 50 KB). Note - TextTrimmer has been devoloped with Microsoft VB.Net 2.0, so requires that its framework should be installed on your Windows XP or Vista. - The TextTrimmer program can be freely used for personal and office purposes, providing that you don't sell it and integrally maintain every copyright and author information. - File dimensions: TextTrimmer works on text files or similar; rows over about 3080 characters length are splitted in parts; as for the rows number, the program becomes more and more slow as they increase (with 3000 rows it may be still acceptable). Have a good test and fun!! © Copyright Giorgio Altichieri - 10/2008. All rights reserved.